Tata’s upcoming flagship model, the Harrier, has become one of the most awaited vehicles in the market. After Tata showcased the H5X concept version of the car at the 2018 Auto Expo, the chief designer of Tata Motors revealed that the production version of the Harrier will retain up to 85% of the design elements from the concept model. A new spy picture clearly shows that Tata will keep its front quite similar to the H5X concept. Tata will start the production of the Harrier by the end of this year. 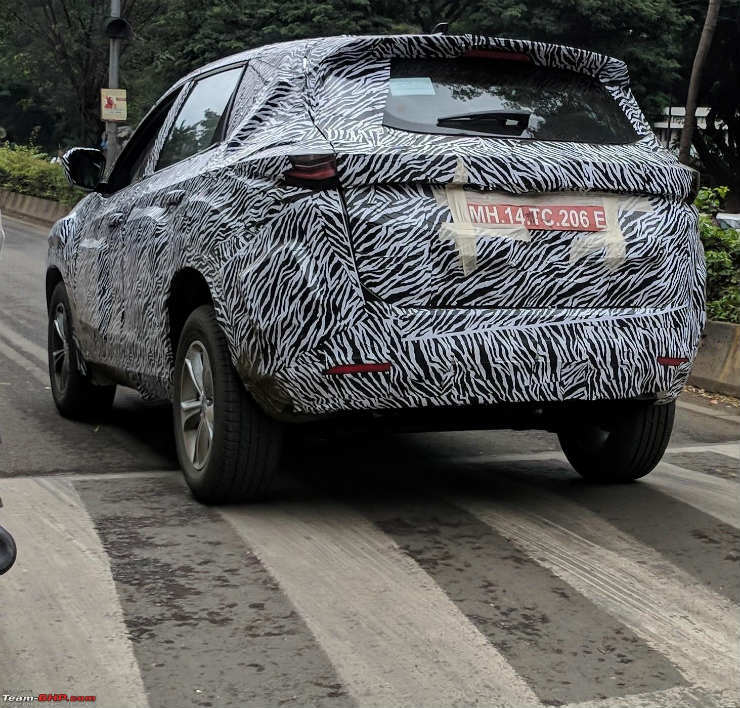 There are quite a few test cars that have been spotted around India multiple times and here is another one that reveals the front of the vehicle. 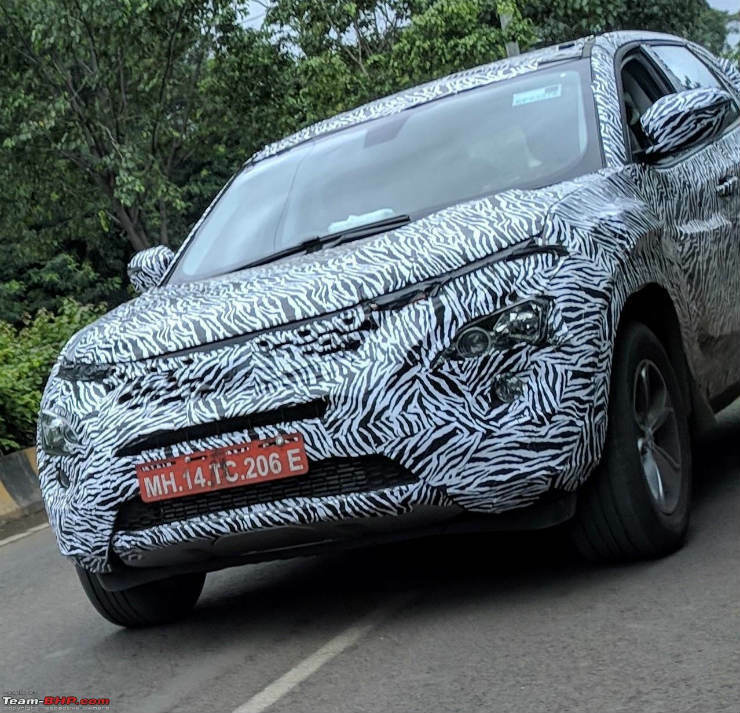 The new spy picture shows that the Tata Harrier will get a thin lighting element, which may work as Daytime Running Lamps (DRLs). Under the LED stripes, the car gets another cluster of lamps that will house low beam and high beam lamps. The Harrier is also expected to get dynamic bending reflectors that will work on the corners to give a better visibility. The Tata Harrier will be the first-ever Tata vehicle that will get the OMEGA platform underneath. The chassis is a heavily modified version of the Land Rover platform that also underpins the Discovery Sport. The Harrier will become the most expensive Tata product when launched. The car will use a 2.0-litre Multijet engine sourced from FCA. The same engine also powers the Jeep Compass in India. The transmission will be a 6-speed manual unit, but Tata will also offer a 6-speed automatic transmission that will be sourced from Hyundai. This will help Tata to keep the price very competitive in the market. The Harrier’s production will start by the end of this year, while the deliveries will start in early 2019. Tata is expected to add a long list of equipment to the vehicle. The Harrier will get a 4WD unit with a Terrain Response system that will make it more capable. Also, we can expect premium speakers and other features like leather seats in the vehicle. Tata will also launch a longer version of the car, which will be a 7-seater. « India’s 85 lakh rupee BMW bike: Someone actually bought this crazy machine!